Nigeria Universities Females Students are Threaten - It's Time to Say NO! Nigeria Universities Females Students are Threaten – It’s Time to Say NO! with them, the Student is Bound to fail his course! This In most case, are Female students who are being threatened and pressurized by Male Lecturers, who are aged to be their parents, and sadly, Thousands of Nigeria Female Students have fall into this Malicious Scheme. However, The Crutech Female students decided that ENOUGH is Enough, as they strongly protested against SOME Lecturers/School staffs molesting them and pressurizing them to choose the options below!. 2. Or Fail Your Course/ Have a Missing Script. About 2000 female students of Cross River University of Technology (CRUTECH) have come out to protest over the alleged 5£xually harassment, molestation and extortion of female students by some staff of the academic institution. These Students decided to Tell the world, and Mostly, the Nigerian Governments/Minister Of Education through placard, that lecturers have continuously/non-stop 5£xually Harass female students of the institution. 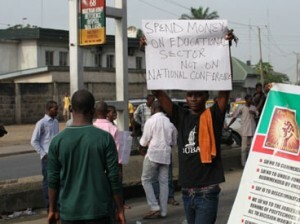 The Crutech Students, which consists of Male And Female Students, carrying Placards, blocked traffic at Eleven-Eleven Bus Stop on their way to the Government House, in Calabar to register their grievance. Sexual harassment of female students. However, the Government have not replied to the students grievence. We sincerely pray that the culprits who are Molesting Our Children in schools being caught and seriously deal with by the Law. Most students from other high tertiary institution have also appraised the Brave move of The CRUTECH students. When we discussed this issue, on our FACEBOOK FANPAGE, we were amazed!! and shocked by mails and replies we got from several Female students that this issue has been on-going in their school of study. Here are a list of Universities we recieved in our FaCEBOOK FANPAGE Mail Box. Obafemi Awolowo University, among others. Do You have ANY Statement regarding this publication? Then use the comment box below to discuss this issue with Other Students and fellow Concerned Nigerians!!. Would You Love To be Notified on Facebook? Then join our ELITE students page on Facebook By Clicking the link below. CLICK HERE TO JOIN US ON FACEBOOK FOR FREE!.